Goodness. Here is a new one, I literally accidentally published today’s post without the story. I always wondered how folks could possibly do that. Now I suppose it really is easy after all, you simply click on the Publish button instead of the Save Draft. Yikes. Oh well. Today’s story really wasn’t only about a recipe, but rather the possibilities of treasured memories gathered over the holiday season by bringing the young ones into the kitchen and sharing special moments together as part of the festive food preparations. There are lots of creative opportunities beyond traditional Christmas cookie baking, stirring the caramel through big bowls of fluffy popcorn and rolling them into balls, or perhaps even adhering assorted gum drops and candies onto the gingerbread house. 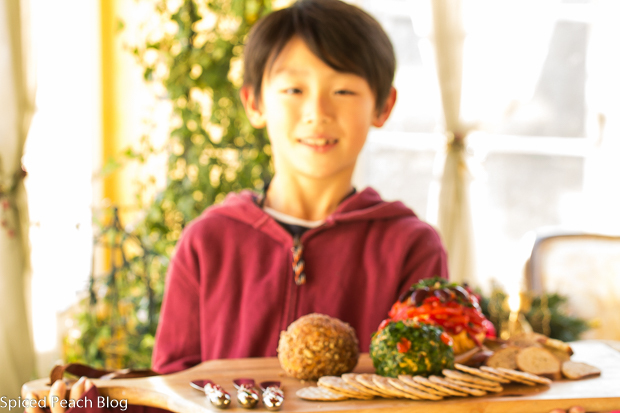 Today our Cooking with Kids: Holiday Cheese Balls provides for a little mixing or pulsing action in blending together the cheeses then adding personal creative touches of their own for the finish. Small bowls or dishes set with prepped accompaniments provide decorating fun in really any variety of choices, strips of seasoned roasted red peppers, black olives, chopped pecans, chopped fresh parsley, or any other colorful savory, perhaps even subtle flavors of sweet. Rolling or attaching individual touches provides kids seasonal entertaining contributions of their own, masterpieces that can be displayed with pride at any holiday gathering, making hearts feel happy and bright. Like I said, the real story is not only about the ingredients chosen, it’s the possibilities of the treasured memories gathered together, these are the special moments of the season. Add the cream cheese into a large mixer bowl fitted with paddle attachment, or, in the bowl of a food processor, whip cream cheese before adding in the yellow and white cheeses, continuing to beat (or pulse) until the cheeses are well blended together. Spoon in mustard, shake in the Worcestershire and Tabasco, sprinkle in the shallots, blend until ingredients are incorporated throughout. 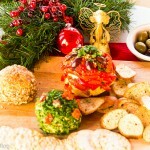 Remove cheese mixture to a platter, divide in half or thirds molding to a ball shape before decorating each ball. Cover and refrigerate until using. Un-decorated Cheese Balls may be wrapped in freezer paper and frozen for a month. Defrost in refrigerator, decorate, serve. 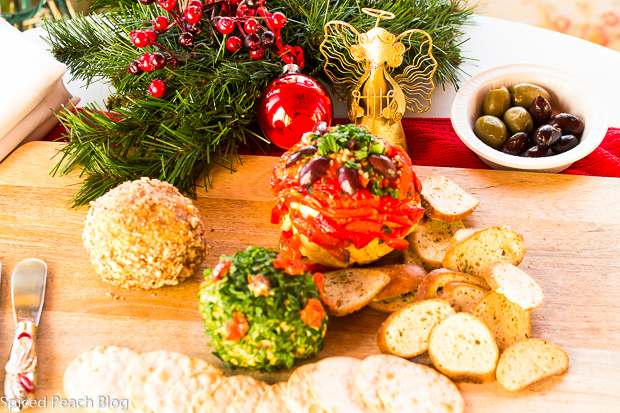 This entry was posted in Appetizers, Cooking With Kids, Holiday Favorites and tagged Cooking with Kids, Cooking With Kids: Holiday Cheese Balls, Hoilday Cheese Ball Recipe. Bookmark the permalink. Post a comment or leave a trackback: Trackback URL. You had me at cheese, Peggy! I love it when kids are in the kitchen too. You can teach them so much about different ways to do things, share stories of generations past, foster creativity, allow for tactile learning, feed the senses, teach sustainability and healthy eating, and so much more. Kudos to you for including your grandson in your culinary pursuits. What a wonderful role model he has in you! Hi Kelly, thanks so much. I so agree, cooking with kids is such a fabulous sharing and learning experience. I began cooking with Jason at 6 months, I would pop him up on the Bumba chair on the bar stool pushed into the kitchen island then guide his fingers with the measuring spoons and cups and just talk to him as we were going along, he loved it, and was so good never grabbing at other things, amply entertained doing what we were doing at the moment. Since you are a teacher and know children so well, I’m sure you know that timing is important too, along with keeping things fun. 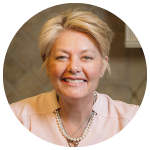 Peggy, it is always fun getting the kids involved with savory as well as sweet recipes – creates the best memories (apart from the wonderful food, of course)! Although I have seen many recipes for Cheese Balls, I have never actually made them or seen them around here! Well, there is always a first time! Hi Andrea, Thanks much. I really enjoy getting my grandson involved in the kitchen and I know you do so with your children too, a nice opportunity for great memories as well as learning! Gorgeous is the word to describe this post. A superb picture and beautiful story. Thank you for sharing this festive feast, Peggy. Thank you so much Jolma! Hope you are well and enjoying the holiday season. Looking forward to seeing your next post on Beyond Her Kitchen! The recipe sounds great, but that being said, the thought process of creating memories through making these is spot on. I can imagine doing this with kids would be perfect. Hi P. J. Thanks so much. Making the cheese balls proved great holiday fun for my grandson! I’ve just checked out your 2015 in review video- really nice job. Wishing you as many happy memories in 2016!